Once the year pass, the population of high-developed countries (particularly) becomes older. This means that in the future, the youth will have to work for the aged in order that the latter receives pension. It will also affect the pension - how? Well if the number of the aged increses, the youth will have to pay for the aged pension. Let's go in Africa or Asia where isn't aged population. Why the Europeans are so unhappy and don't born children? Europeans are more civilized than Africans, that's why they are reasonable at this problem. Thus, if they understand that it's very difficult to grow a child and give him everything for being happy they simply don't make them. On the other hand, if the number of people increases in Europe, it will ease this problem but will generate other. 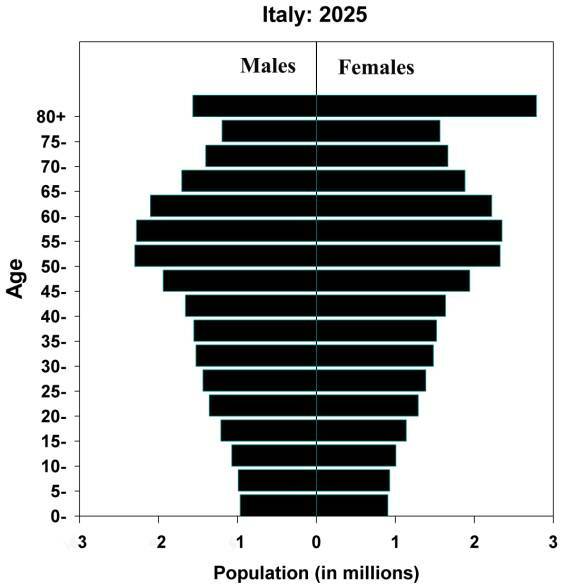 the problem is now solved in Europe by increasing the retire age. If people offer more productivity and retire at an older age, they will receive less pension. But people are not happy about that, they want to retire earlier. Societies use three methods of maintaining themselves: government, family, and personal saving. In developed countries, families use to support children, while government is the main source of support for the aged. In the most developed countries (according to UN classification) with a population of 1.2 billion people, the average age rose from 29.0 in 1950 to 37.3 in 2000, and is forecast to rise to 45.5 by 2050.
the youth will have to work more and more for maintaining the old. By 2030, the ageing index will reach 100! The new generation is not gonna be to happy if it does nothing in this matter. I mean in the past there weren't so many problems as in the present. Now the world is collapsing and the young generation will be the one who will have to overcome the consequences of our and our ancestors' mistakes. you said it brother, I can't imagine myself old, near my grandson who laughs at me because I don't understand their young style of life. clearman Wrote: Let's go in Africa or Asia where isn't aged population. Why the Europeans are so unhappy and don't born children? The most prosperous countries seem to have the most number of unhappy people That's weird. that's normal. When you have all the necessary sources for living and enjoying your life, you're not so happy as when you fight for and gain these things. Steven Wrote: that's normal. When you have all the necessary sources for living and enjoying your life, you're not so happy as when you fight for and gain these things. I once saw a TV show about a man. This man is a millionaire, but during the daytime he has a special hobby - begging. He said "You should be from time to time poor, in order to understand that you are rich"
Did you know that in UK, there are more people of pensioning age than children aged under 16? It's a bad sign, soon it will need help for its workforce. M.Helen Wrote: Did you know that in UK, there are more people of pensioning age than children aged under 16? It's a bad sign, soon it will need help for its workforce. yes, I knew that. BTW it concerns not only UK. Germany, France, Belgium are not far from this situation. In these countries people prefer to have no or only one child in the family. Thus, the population gets quickly older. In 2000 people aged over 60 made up 600 million people, which is 3 times more than in 1950. In 2006, this number represented 700 million people, while in 2050 the number is expected to reach 2 billion people. M.Helen Wrote: In 2000 people aged over 60 made up 600 million people, which is 3 times more than in 1950. In 2006, this number represented 700 million people, while in 2050 the number is expected to reach 2 billion people. population aging also gives birth to the issue of overpopulation. These two problems are interrelated. The only real solution is to find life on other planets and to make robots work for people, like in movies. 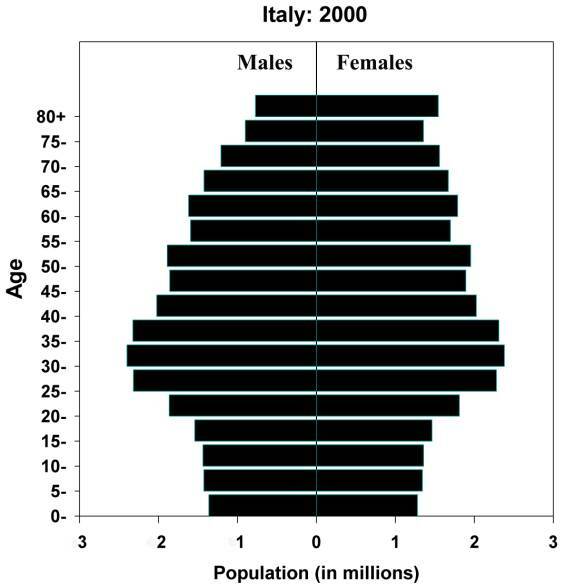 Compare these pictures, the first shows population ageing in Italy in 2000, the second shows population ageing forecast in the same country. Yes, it’s true but… I heard that there has been carried out a survey in order to find out in which country live the happiest people ( I mean feel themselves happy). It turned out that people in the poorest countries are happier than those who live in the developed ones. That’s why there is no reason to believe that for making a child you must have everything… It’s enough to have sth to eat, drink and to wear on.